This is a beautiful colonial house with spacious areas and comfortable rooms. 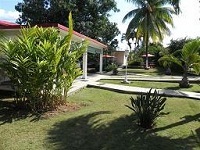 It has 5 bedrooms with air conditioned with 3 bathrooms (cold and hot water shower). The casa has a big portal with street’s view and a frontal garden, and it has backyard or terrace. This house has also a big parking area. It is located in one of the main streets of Havana’s area.